This page will be updated in irregular intervals. Connecting PCI cards to an AVR ATmega. 33 MHz PCI is specified to not only fixed 33 MHz, much slower clock rates are also allowed, as well as non-uniform clock speed. The good thing is that the clock is provided by the system board - which is emulated by the AVR. So the clock is slowed down to whatever the AVR can actually handle. 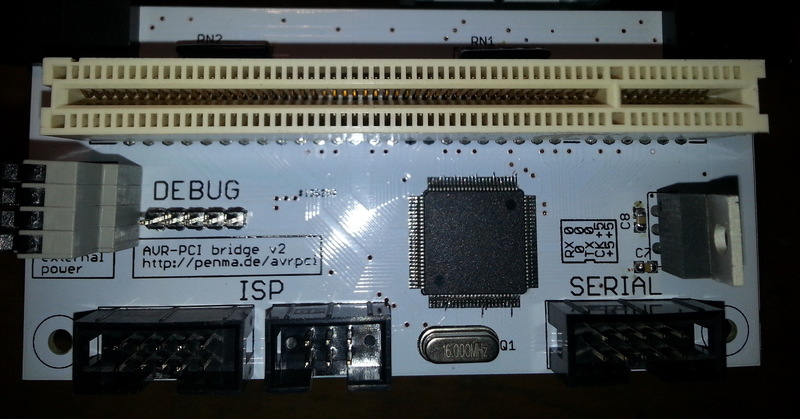 I am currently using a development board with an ATmega2560 on it. PCI has quite a lot of pins that are used in both directions, so I can directly access all signals without extra hardware. The 2560 was just the cheapest one I could get right now. Together with a riser card and jumper wires, the board is able to talk to two cards on the same bus. Future versions might use bidirectional shift registers and/or I2C port expanders instead. There is an untested layout with a much cheaper ATmega32 and four 74HC299. It will probably be revised. Everyone on the internet says that it is impossible to talk PCI using an AVR but apparently nobody has actually tried it. This has to change. Also, I wanted to connect an AVR to the network and I fiddled around with the infamous ENC28J60 modules, which are quite easy to get working. But they only support 10baseT. While the AVR can probably not process packets at 10 Mbit/s anyway, interesting things happen when you connect 10baseT devices to modern networking hardware. In 10 Mbit Ethernet, the TX and RX pairs had designated plus and minus wires and the polarity was relevant. Starting with 100 Mbit, the wires had no specific polarity anymore. At some point in the past, circuit board designers of switches started swapping the plus and minus wires internally on some ports, because it made routing the traces easier - and since the whole world is using unpolarized 100 Mbit or Gigabit anyway, nobody cares. The obvious fix: use real network cards instead of toys. 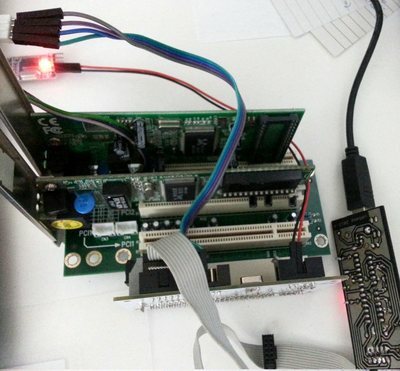 A RTL8139D card from Level One was tested and detected correctly (although in the beginning it appeared to not work and was sometimes detected as 8131, but this was never reproduced). Currently working on a driver for this card. Missing features in the PCI protocol support are added as needed. Two RTL8139B cards tested, need a few cycles after powerup, but otherwise work fine. Currently trying to obtain other RTL8139 variants (B/C) for further testing and driver development. Card 1 (8169S-32) seems to work fine. Currently developing a driver. Card 2 (8169SC) needs a bit more time for power to stabilize, or it won't work. It does however not need extra PCI clock cycles, any kind of delay will do. Setting output pins works. Other things have not been tested yet. Most of these should work fine if anyone could be bothered to write a driver for them. Before that happens, there should be some kind of PCI driver framework for AVR. Maybe it is made partially compatible to Linux or FreeBSD, so porting drivers gets very easy, but still suitable for the limited target platform. Interesting things happen when you run cards on an unusual bus. The PCI specification demands a large number of PCI clock cycles after a bus reset before any data transfer can start. At the slow clock speed of the AVR, this takes several seconds. While some cards do not care about the clock cycles (notably, Realtek network cards, but also the Token Ring card and the VIA USB), others (Silan, Adaptec, NEC, firewire, and sometimes the Accton) are very strict about it. Currently the extra cycles are disabled because they waste time. In the future, the necessity for extra cycles will be detected automatically. It appears some cards run some circuits on the PCI clock. Slowing it down will then lead to interesting behavior in these parts. A network card sometimes does not receive any packets if the PCI clock is stopped. 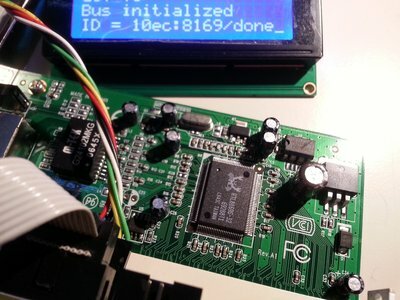 Support being a target, so that the card can become bus master and read/write packet data from/to RAM. PCI burst transfers. The current code terminates the transaction after 32 bits were transferred. The spec considers this legitimate behaviour. However, it makes things even slower than they already are. Find out how to stop __attribute__((always_inline)) from producing tons of useless warnings when combined with link time optimization. Synchronize PCI clocks running on different timers, so two cards can communicate with each other. It's currently a mess. But it will eventually appear on Github.